Retired soldiers and ex-agitators from the Niger Delta region are reportedly gathering forces to battle the Niger Delta Avengers, NDA. A top government bureaucrat, who is an ex-army officer disclosed that “the plan has reached advanced stage, some retired army officers from the Niger Delta region have met and may call a larger meeting to take up the fight themselves if the militants do not stop destruction of oil and gas installations. “We have kept quiet for too long and with the way the militants are going, they do not seem to understand that they are destroying our environment and inviting the security agencies to come to our territory and kill our people,” he added. This came as the Movement for the Emancipation of Niger Delta, MEND, which gave government a two-week ultimatum, last Saturday, to declare its stand on the planned dialogue, extended an olive branch to the Avengers to join its Aaron Team 2 for peace talks with government, but under stipulated conditions. 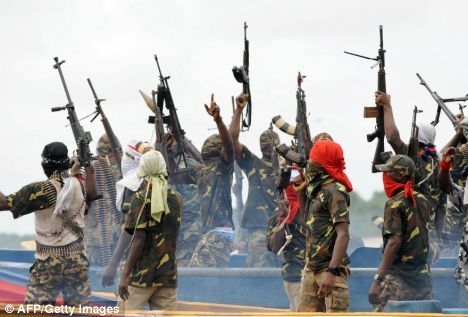 Meanwhile, the Niger Delta Revolutionary Crusaders, NDRC,has taken MEND to task for conferring on itself the authority to negotiate on behalf of militant groups in the region, saying it does not have such power. Voice Delta in a series of tweet, said: “We also advise the government to be wary of political jobbers who would want to exploit the problem posed by the criminal gang, NDA. Just like the concept of civilian Joint Task Force, JTF in the North East, ex agitators in the region are ready to help the government in stopping the NDA. “Buhari should therefore consider this option, we are willing and ready to assist the government in achieving a sustainable peace in the region and we also advise the government to be wary of political jobbers who would want to exploit the problem posed by the criminal gang, NDA,” it added. “We are not unaware of the quest by Buhari to see that Nigeria meets its production quota of 2.2 million barrel per day, mbd, hence his desire to seek peace. Just as we posited in the past, any negotiation must be holistic and should be broad.